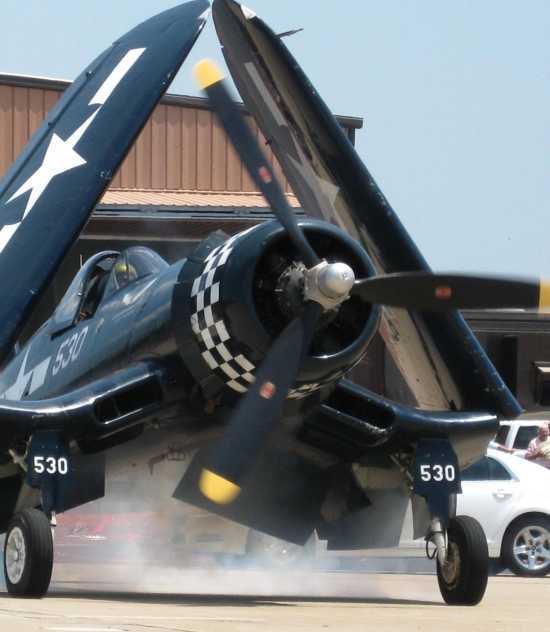 With smoke belching from it's Pratt & Whitney Radial engine, this Chance-Vought Corsair cranks up on KCGI's ramp this past Sunday. A World War II Carrier-Based Fighter (the reason for it's space-saving folding wings), the Corsair is most often associated with the war in the Pacific Theatre, but actually served in large capacity around the world and with several air forces. It's trade-mark "Bent Wings" were the designers' solution to providing just enough ground clearance for it's massive propeller, while allowing it's landing gear to be built short enough, and stout enough to withstand the harsh punishment of carrier landings. Like many great aircraft, it was initially tagged with un-flattering names like "Widow Maker" from training accidents as it's cutting-edge mechanical design and piloting requirements were worked out. Once the problems were solved, and it was able to show it's stuff, it was referred to by Japanese soldiers as "Whistling Death" for the sound made by it's inter-coolers (the large air scoops in the front of the wings close to it's body). It also came to be known as "The Angel of Okinawa" for it's ferocious support of the troops who were fighting to take that island.